In this video, I discuss growth vs ROI and how to think about where you want to be on the spectrum between the two extremes so that you can create the right marketing strategy for your business. 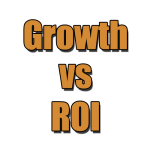 A pure ROI strategy is completely different from a pure growth strategy. What works for one is extremely likely not to work for the other. So knowing where you want to be in my experience is how you develop the best strategy for your business so you can leverage the right marketing tactics to successfully execute.